The twos are NOT terrible, they are TERRIFIC! They are curious, enthusiastic, growing every day in so many ways: socially, emotionally and cognitively! At Rose Hall we provide a prepared environment. The Toddlers enter a room chock full of interesting activities: beginning numbers; vocabulary; size, shape and color; puzzles and matching games. There are shelves of fine motor activities — so enticing to a young child. We change the color scheme by the seasons to refresh these shelves and encourage the children to become aware of the season and holidays. Songs and games at line time lead up to a group snack. This is a great time to work on manners and to become aware of cooperating in a group. The children learn to pour their own drinks and to clean up after themselves as well. Finally, it’s on to the indoor playroom or out to the playground. Very early on, the children are taught how to put on their own coats and shoes. 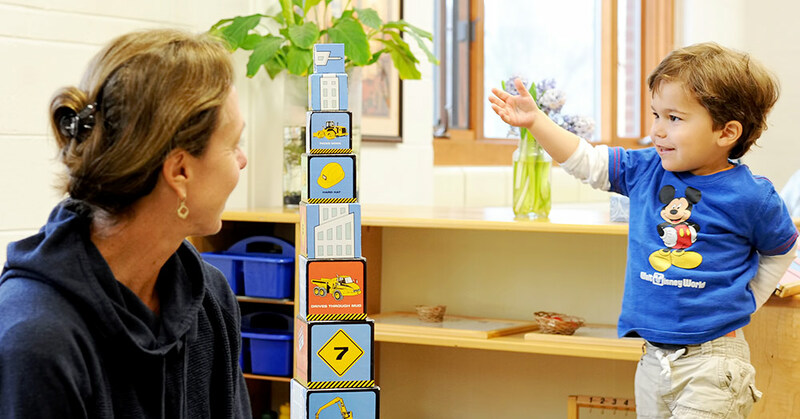 Our Toddler Class prepares children well for the Preschool Program and sets the foundation for lifelong learning with a sense of independence and responsibility.